People often find it difficult to make yogurt at home. It is all too often that we end up with yogurt that becomes too loose a liquid or sometimes it becomes too thick. Sometimes the fermentation went wrong and people failed to make the perfect yogurt. Well, we’re here to help. People are usually forced to buy yogurt from the supermarket. But that yogurt is not natural and not at all healthy as it contains additives, artificial flavors and sweeteners to give you consistent yogurt. 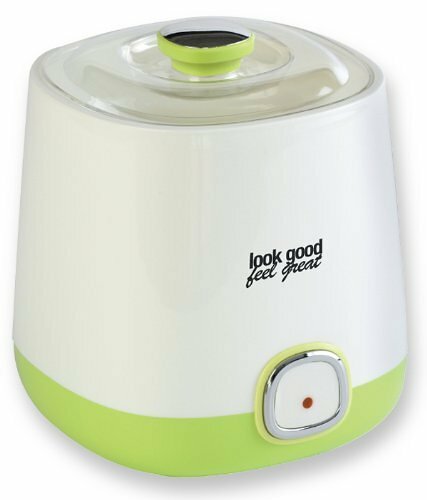 We recommend a yogurt maker, which are specifically designed for this purpose, but many of us already have crock pots or slow cookers and use them day to day. For this reason, I have decided to give you the recipe of making yogurt using a crock pot. A Crock pot is an electric container that helps you in cooking different things like soup, stew and yogurt etc. A Crock pot can also be used for heating as well as incubating milk which is useful especially for the making of yogurt. Using our recommended crock pot, I am going you share with you the recipe through which you can make yogurt. First of all, you need to add the milk to the crock pot. The milk can be from any source like it can be goat’s milk or cow’s milk, or some other source. The yogurt remains unaffected based on the source. Heat milk and let it to boil till it reaches 180 to 190 degree Fahrenheit, after boiling, let the milk to cool down to room temperature at approximately 100 degree Fahrenheit. You can use the thermometer to get the accurate temperature readings so that the yogurt will be perfect. Take at least half a cup of warm milk and add at least 2 tablespoon of yogurt starter. Stir slowly and firmly with a whisk for about 3 minutes. Add this mixture to the milk in the crock pot. Stir smoothly. Yogurt starter is used to add bacteria to the milk which performs fermentation to make the yogurt. Cover the crock pot with its lid and keep it in oven or some warm place and let it settle. The fermentation process starts and it takes almost 5 to 6 hours to make perfect yogurt which is healthy and delicious as well. Your home made yogurt is prepared and ready to eat. You can also add flavors like almond essence or strawberry essence to make flavored yogurt of your own choice. The temperature of the milk must be accurately maintained otherwise the yogurt could not be made perfectly. At temperature higher than 100 degree Fahrenheit, the bacteria were killed and at temperature lower than that cannot excite bacteria resulting in no yogurt at all. The quantity of milk may vary and so is the time of heating and boiling. The size of the container or crock pot has the direct relation with the heating and yogurt starter used. So be careful while making yogurt. That’s quite simple. Isn’t it? The process isn’t that tough and though a yogurt maker does make the process even easier, this is a simple way to make your own at home if you already have a crock pot. Now make your own yogurt at home and eat healthy yogurt without additives and artificial flavors which can be harmful for your health. Everybody has their preference when comes to what type of yogurt to make. For many people, soy yogurt is the best option, whether it is due to dietary restrictions or just preference. But store bought soy yogurt, as you might already know, is expensive, and often not as nice as home made. Making it at home is not only much cheaper, it can be tastier and let you experiment too. Producing your own soy yogurt is easy. You first need to have soy milk. This can be bought at a store or made from a soy milk maker. You will also need a starter which can also be bought in many stores. With those two in hand, the next thing to do is making a choice about which yogurt maker is the top option for soy yogurt. As long as it can make other types of yogurts without problems, most yogurt makers will make simple work of Soy, and not have any problems, but there are some that do the job better than others. Not all yogurt makers cut it when it comes to making yogurt. However, there are others with a track record of producing great soy yogurt like the Euro-Cuisine YM100. It represents good value for you money. 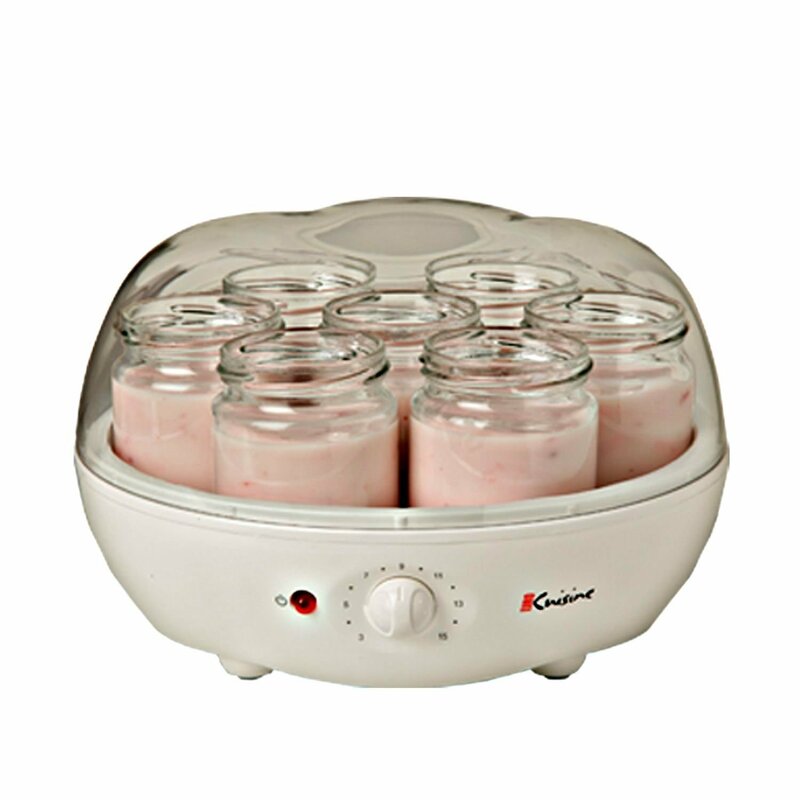 It is affordable and makes soy yogurt without any problems. I would have gone with the cheaper YM80, but the lack of a timer might put you off, with a timer you can set it up and forget about it until it is done. The YM100 comes with 7 glass jars that are dishwasher safe. Cleaning them is nothing to really worry about and if you want, you can get a bigger container which fits in the maker nicely. Having seven jars is also great for making individual servings and playing around with flavours. The automatic shut-off timer is really handy if you forget to turn the unit off when fermentation is done. The only downside is that this does not always work if you forget to take your yogurt out and refrigerate it after 12 hours. Heat trapped by the lid has been known to keep on cooking the yogurt. This is fine if you’re able to remember to take it out, but there is an even more convenient option. To avoid that problem, you can get the Cuisinart CYM-100. The yogurt can stay in it for as long as it can without being over-fermented. This is because of its cooling system that kicks in once fermentation is done. The CYM-100 comes with one large container instead of jars as in the Euro-Cuisine YM100. If you’re looking for a cheaper model, you could go with the Euro-Cuisine YM80, even if it does lack a timer. You might also want to consider the Dash Yogurt Maker. It is among the few low-end makers that produce great soy yogurt. This one too has a single large container which will make good quantities of product with ease. It doesn’t boast all the features of some of the others but that isn’t a problem for many of us. 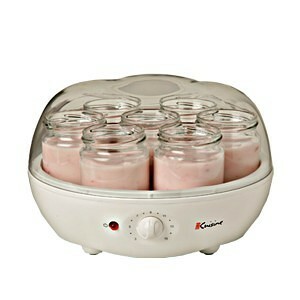 And as a bonus, I find the Dash Yogurt Maker nice to look at. You will surely have no trouble putting it on your table for everyone to see. I hope you found this article helpful. Making soy yogurt at home is a nice way to look after your health and if you’re on a diet that requires you to have soy milk there is no reason you should be restricted. 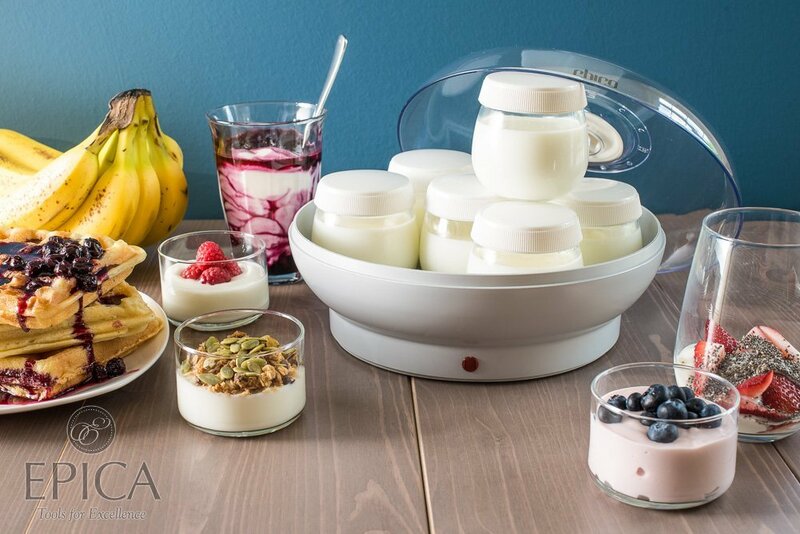 Hopefully you have just discovered some of the top yogurt makers that will help you achieve yogurt perfection! 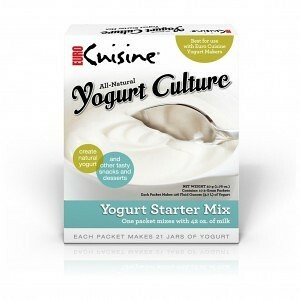 This entry was posted in Cuisinart, Yogurt Making. If you’re a fan of yogurt and add it to the grocery list each week, you should consider making your own yogurt. In addition to being cheaper than store-bought yogurt, homemade yogurt is often healthier – it cuts out sugar and artificial ingredients – and tastes better. You likely have everything you need to make a batch of yogurt in your kitchen already, so let’s get started! You may not get the consistency you are looking for the first few times you try it, but don’t despair. Practice makes perfect! In time you will figure out what works and tastes best for you and you might even start to get creative with your own recipes. Here are a few basic recipes to get you started. Enjoy! Create a double boiler using two stock pots and bring the milk to 185°F, stirring constantly to avoid a top layer forming. Cool the milk to 110°F using a cold water bath, stirring again to avoid a top layer forming. Pour the plain yogurt into the milk and stir well. Cover and place on a heating pad and leave undisturbed for 7 hours*. Remove from the heating pad and stir well. Refrigerate overnight to completely chill. *If you prefer a more tart yogurt, incubate the yogurt longer. I suggest you follow this recipe the first time you make yogurt and adjust the incubation time when you know what you like. Reserve ¼ c of milk and pour the rest into a large pot. Boil. Once milk begins to boil, shut off heat and let sit. While milk is cooling, mix together yogurt and reserved ¼ c of milk. When milk reaches 100°F, mix in yogurt and reserved milk mixture. Mix gently and thoroughly, then cover and wrap in a towel. Using a cheese cloth, drain yogurt inside a colander. Every few hours, squeeze the cheese cloth or use a spoon to stir and help it drain faster. Yogurt is complete in 6 hours. Add honey and/or fresh fruit, if desired. *If you stop at this step, you will have regular homemade yogurt. Continue with step 7 to make Greek yogurt. If you are adding the strawberry flavor to homemade yogurt, it is best to add the strawberry syrup to the yogurt while the yogurt is still warm and before it sets so it can maintain a thicker consistency. Yogurt, whether traditional or Greek Yogurt, has become a “superfood” in today’s society and people flock to the store to stock up on their yogurt for their weight loss journeys. 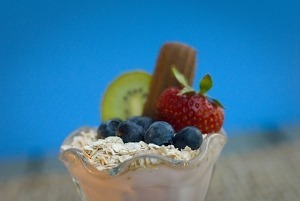 In addition to being healthful, yogurt is just delicious! Unfortunately, most name brand yogurts have a number of unhealthy additives – sugar, high fructose corn syrup, artificial flavors and dyes, among other ingredients – that end up making the store-bought yogurt not as healthful. These ingredients can almost balance out the health benefits of yogurt, making your delicious snack a wash. Fresh, homemade yogurt has good bacteria that help with digestion and kill harmful viruses; store-bought yogurt, on the hand, is difficult to digest and the quantity of good bacteria decreases after being refrigerated for so long. Additionally, store-bought yogurt is generally fermented for a short amount of time, which does not allow the good bacteria to develop and gain the strength necessary to be helpful to your body. The short fermenting time does not allow the yogurt to become as thick and creamy as we see in the grocery store, so the manufacturers must add unnatural ingredients to make it the thick substance with which we are familiar. Finally, because store-bought yogurt is so cold and heavy, it can actually increase weight gain instead of help unwitting customers drop the pounds. Buying organic yogurt is certainly healthier than buying regular, store-bought yogurt, but it can be an expensive habit. Your homemade yogurt will be rich in calcium, protein, riboflavin and various vitamins. There are a great many additional benefits to your homemade yogurt – fat loss, muscle gain, combat stomach problems, and much more, including cancer prevention and immune system benefits. Even better, you will be able to add flavors such as fruits and nuts without having to add sugar and other artificial ingredients. In that vein, you will also have total control over what flavors and how much of the flavors go into your yogurt. The health benefits to making your own yogurt along with the ease of doing so makes the practice of making yogurt easy to get into; not to mention it will help cut your grocery bill, a benefit that can’t be overemphasized for most of us! You can certainly buy an electronic yogurt-maker to begin your yogurt practice but it is also just as easy to make it by hand; all you need is a quart of organic whole milk – the best is to use organic, whole milk from a local supplier – and two tablespoons of yogurt. Though you will need to use store-bought yogurt as the base in the beginning of your yogurt making, you will eventually be able to make your own yogurt with milk and previously made yogurt. When you make your yogurt, remember that every pioneer project takes some time to perfect; don’t be nervous! Your first batch or two may come out a bit funny, but keep trying until you make the yogurt you find tasty. When you do find that perfect batch, make sure to set two tablespoons aside for your next batch. Your homemade yogurt will typically last five to seven days in the refrigerator and be a little runnier than what we find in grocery stores.